get these measurements, and then you can get the correct part number using the chart. 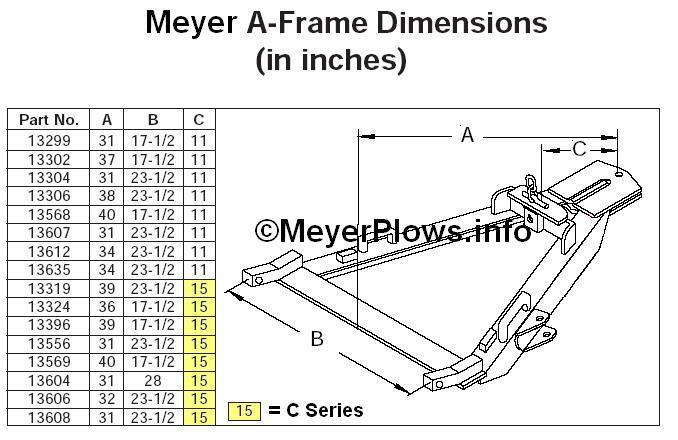 Meyer ST A Frame - 31"
Genuine Meyer EZ Classic A Frame. Measurements are listed. MEASURE YOURS BEFORE ORDERING! Limited to the 6 we have on hand. We reserve the right to cancel orders and issue refunds if sold out. Genuine Meyer Sector for ST Series plows. Fits ST-78, ST-90, ST-7, STP-7, STP-7.5, ST-7.5. LIMITED TO THE 10 ON HAND. When they are gone, the price goes up to $375.00!